This weekend the fall season officially arrived and with it came some lower temperatures. 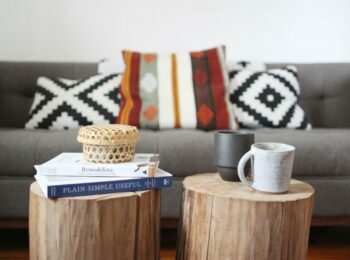 Now, in the past my first instinct would have been to immediately swap my summer linens for my sweaters and simply say goodbye for the next several months, but this time around, I wasn’t ready to put them away just yet. 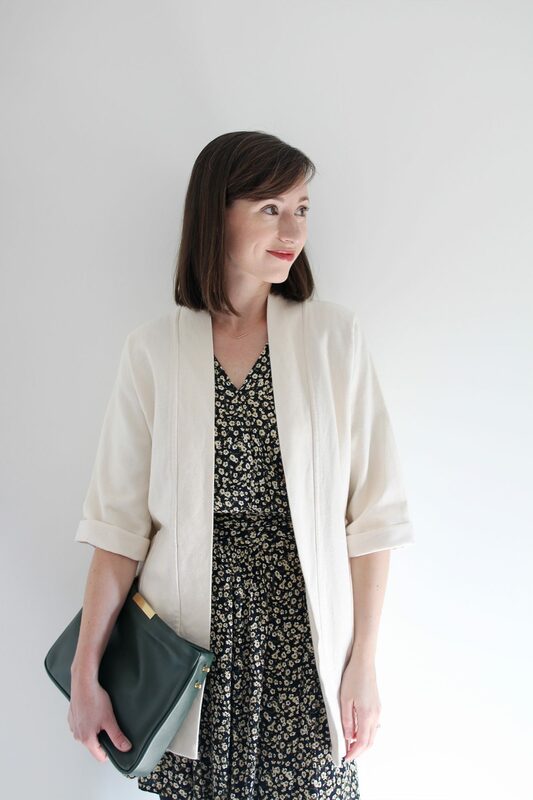 I have really enjoyed my warm weather closet this year and I thought it would be fun to show how I’m transition some of my favourite summer items for cooler weather instead of just diving full force into all things warm and cozy. Not to worry though, we’ll get there soon enough! With this in mind, I pulled a variety of my summer closet heroes to play around with and style into more fall-friendly looks. It was so fun to mix different textures, patterns and fabrics and hopefully these outfits will give you some new ideas to help extend the seasonal life-span of your summer closet! So let’s take a look at my tips for making your warm weather faves work in cooler temps! THE ITEM: Striped Jumpsuit made of a linen/tencel blend. 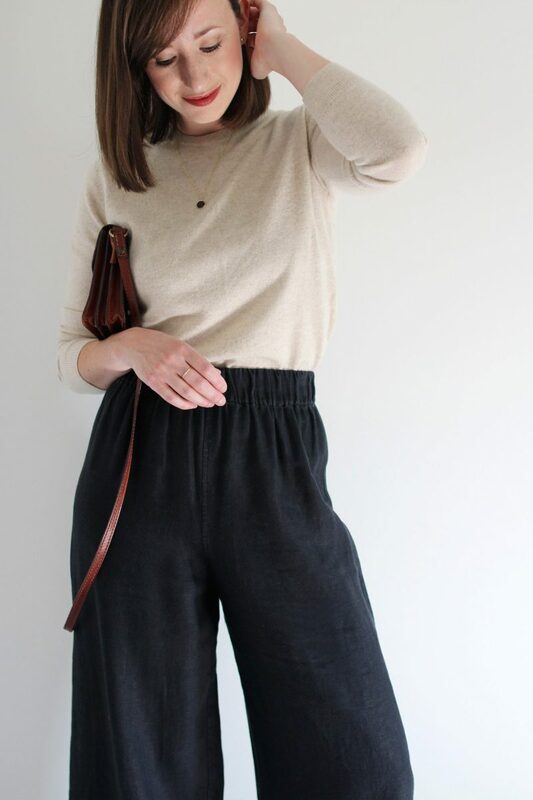 THE LAYERING TECHNIQUE: Since this jumpsuit has short sleeves, I felt that a base layer might look odd so I went over instead with a loose cashmere sweater and added a pair of black leather ankle boots. I love how the jumpsuit instantly transforms into pants! You’d really never know there was a whole top under there. 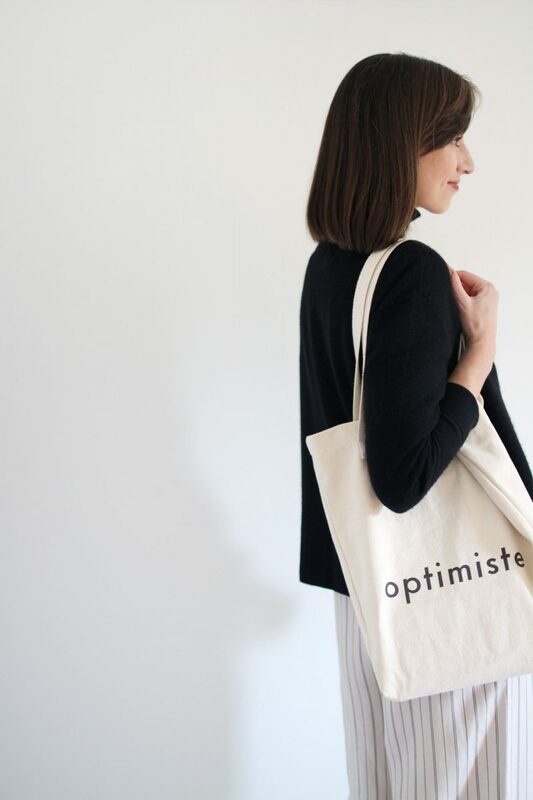 A graphic tote bag keeps the vibe relaxed and black ankle boots add that ready-for-anything touch that instantly balances out the summery feel of a floaty striped pant. Ps. It’s still easy to shimmy in and out of when nature calls but it’s toasty warm when you’re in the elements. MY THOUGHTS ON THIS ONE: I kept this one super simple and yet, I don’t find it boring. There are only two colours in the whole look, a rich black and a natural off-white and this minimal palette feels purposefully understated. I wish this turtleneck sweater was more cropped in length (like this one) but it’s what I had on hand and I think it still works pretty well since it has a wide fit and lots of movement. 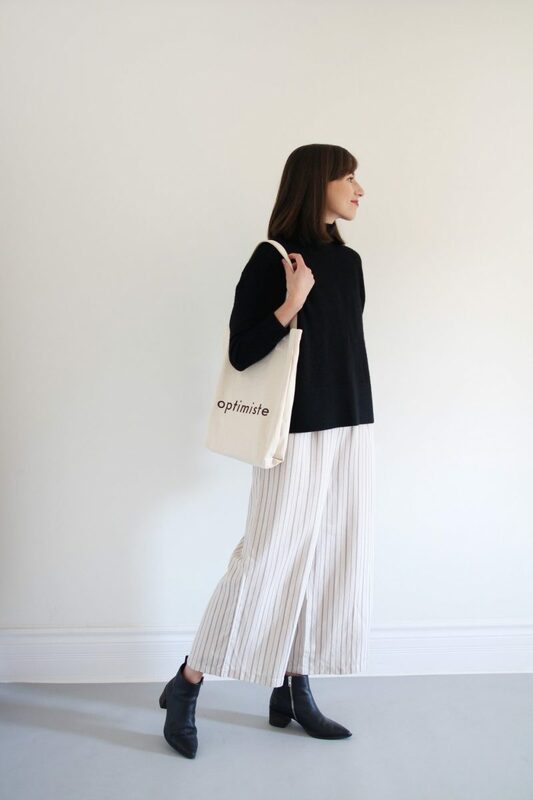 The stripes give the look some intrigue and the playful tote adds a perfect touch of whimsy. I love this one for any casual activity like running errands, a day in the office or a weekend around town. 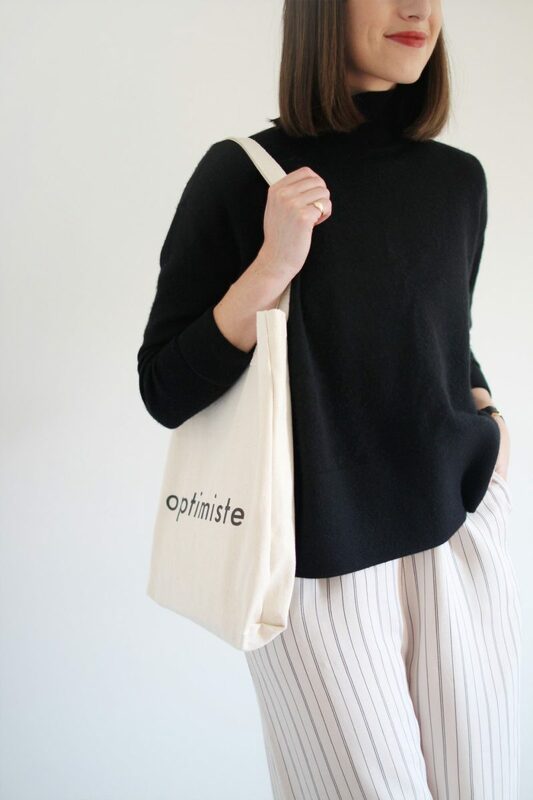 Canvas Tote | old Tessa Hughes | Linked to similar by Baggu for $15 USD. Boss Boots | gifted Everlane | $225 USD | True to size. | Also love the new Day Boot! Pinky Signet Ring | borrowed ATTIC | $620 CAD $558 CAD with ‘STYLEBEE10’ until October 5th. | Made to order in Toronto | See the full feature here. THE ITEM: Floral print mini dress made of a rayon material. THE LAYERING TECHNIQUE: This one is pretty straight forward. Simply adding black tights to just about any dress, will put you well on your way. Next, a black, heeled ankle boot elongates the leg and maintains a sleek lower half. Then a simple coat that hits a few inches above the hem of the dress makes for a visually pleasing effect. 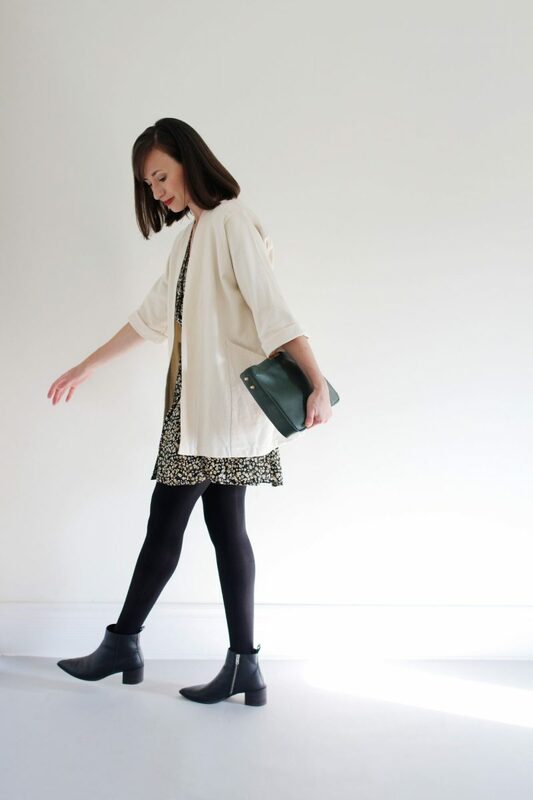 Aim for a light tone in the coat to balance out the dark tights and boots. Finally, pull from the colours in the dress pattern (if it has one) and choose your accessories to match. In this case, I noticed the green tone and selected my bag based on that. MY THOUGHTS ON THIS ONE: I can’t quite bear the thought of putting this dress away yet, since it was one of my favourite pieces to wear this summer. A simple solution to wear it into the Fall was to add black tights and ankle boots and I think it worked out really well. Even though it has a summery floral pattern the darker tones help extend its seasonal appeal. Since the dress has a fair amount going on (full skirt, wrap waist, busy print) I kept everything else as minimal as I could but pulling tones from the pattern like my green bag and off-white jacket. I also opted to pin the neckline closed a bit higher up so there is not as deep an opening. 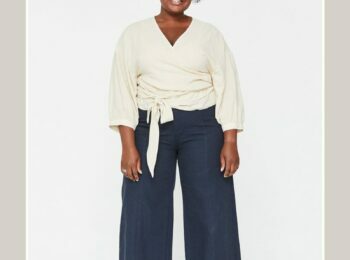 This one is perfect for a dinner date with the fella or my girlfriends but it’s also good for a work meeting or coffee chat! Floral Dress | sold out Faithfull the Brand | Linked to similar. Meena Clutch | gifted Opelle | $345 CAD | Made in Toronto | Colour s/o but black is available. Black Tights | old | Responsibly made tights available here. Bayonet Necklace | borrowed ATTIC | $375 CAD $337.50 with ‘STYLEBEE10’ until October 5th. | Made to order in Toronto | See the full feature here. 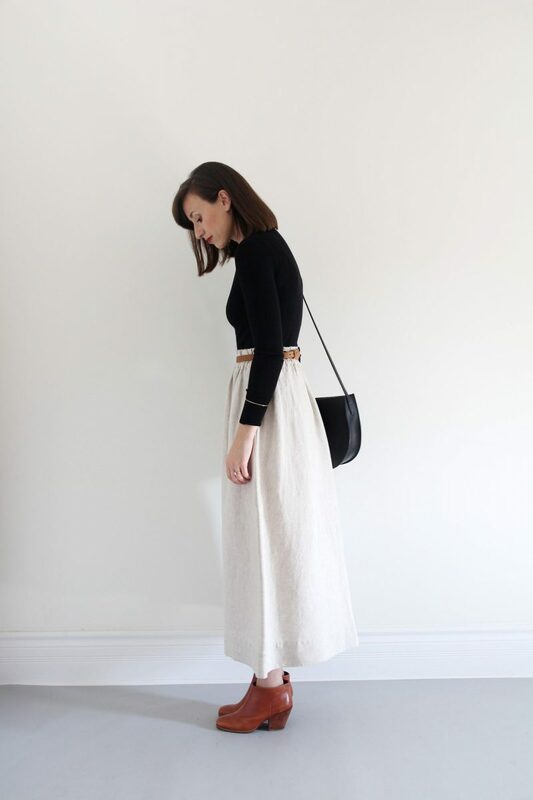 THE ITEM: Bel midi skirt made of a mid-weight linen. 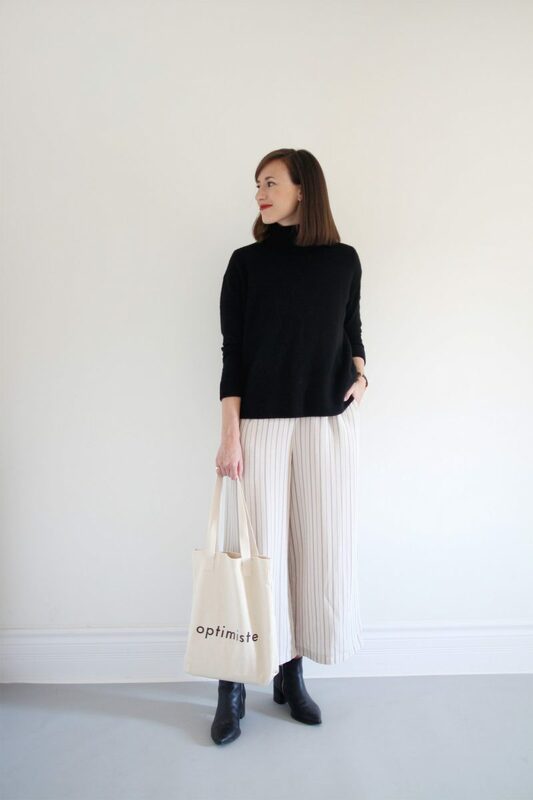 THE LAYERING TECHNIQUE: Slip into a fitted sweater in a lightweight wool in a contrasting tone (in this case that’s black). 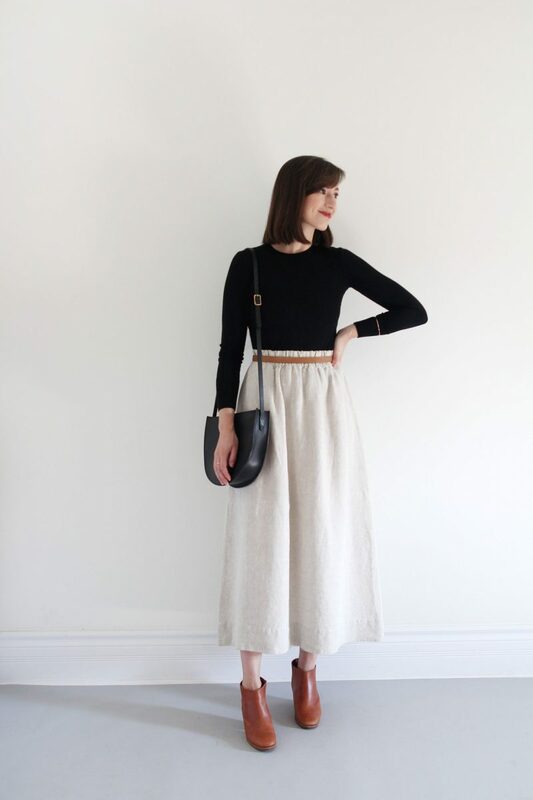 Fully tuck the sweater into the skirt’s waistband and layer a leather belt over top (slide the buckle to the back for a sleek line). 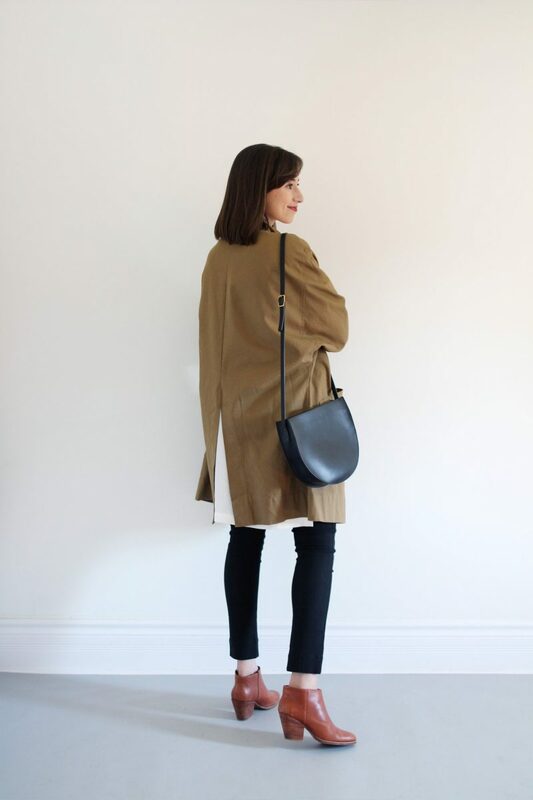 Pull on your favourite block heel ankle boots (bonus if they are a similar tone to your belt) and grab a sculptural bag. Et voila! 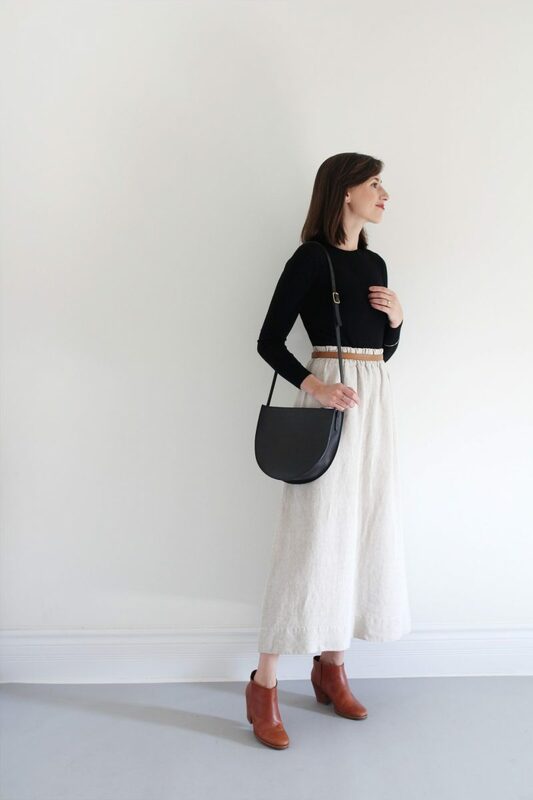 MY THOUGHTS ON THIS ONE: I had been wracking my brain for ways to style my favourite (and only) summer skirt. Since it’s a fairly full skirt and quite long I wanted to avoid too much extra volume, so a sleek top, defined waist and a bit of ankle peeking out kept the proportions balanced. I LOVE how this look turned out and can’t wait to wear it IRL. Pinterest really came through with the inspiration on this one and my outfit is a combination of this idea (fitted black knit) + this styling trick (a brown belt) + this whole concept in general! Mars Boot | Rachel Comey | $426 USD | Made in Peru | Similar option for less here. Dome Studs | $260 CAD $234 CAD with ‘STYLEBEE10’ | Oval Bangle | borrowed ATTIC | $590 CAD $531 CAD with ‘STYLEBEE10’ until October 5th. | Made to order in Toronto | See the full feature here. Brown Belt | old H&M | Linked to similar. 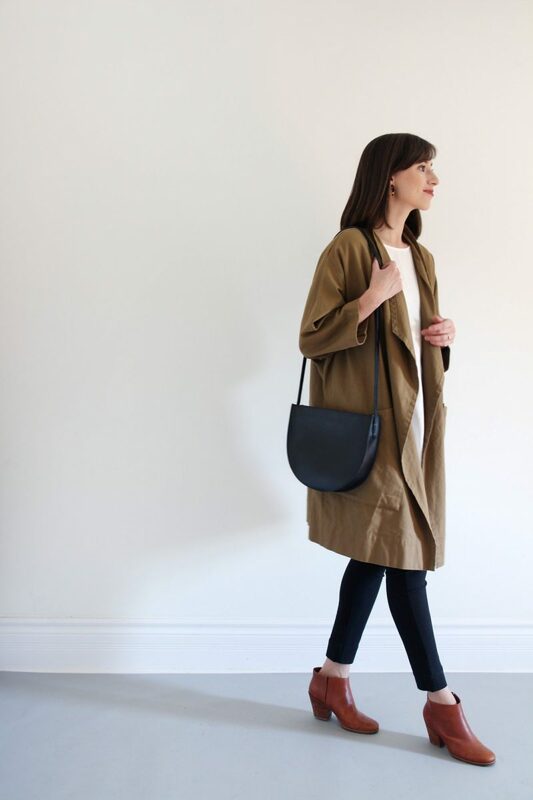 Eloise Black Bag | sold out The Stowe | Made in Montreal. | Linked to similar. 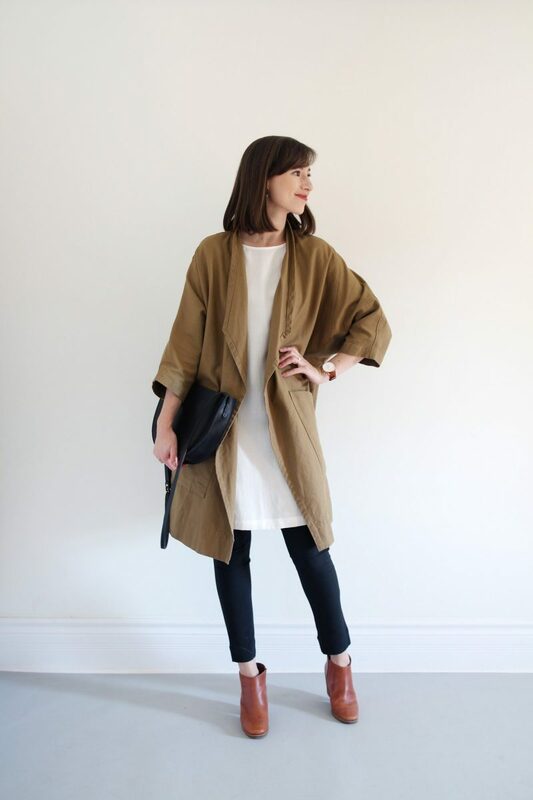 THE ITEM: Relaxed tunic/dress made of a tencel/linen blend. THE LAYERING TECHNIQUE: In this case it’s less about technique and more of a balancing act. Whenever I wear a lot of volume on top, I like to pair it with a super slim fitting pant on the bottom. 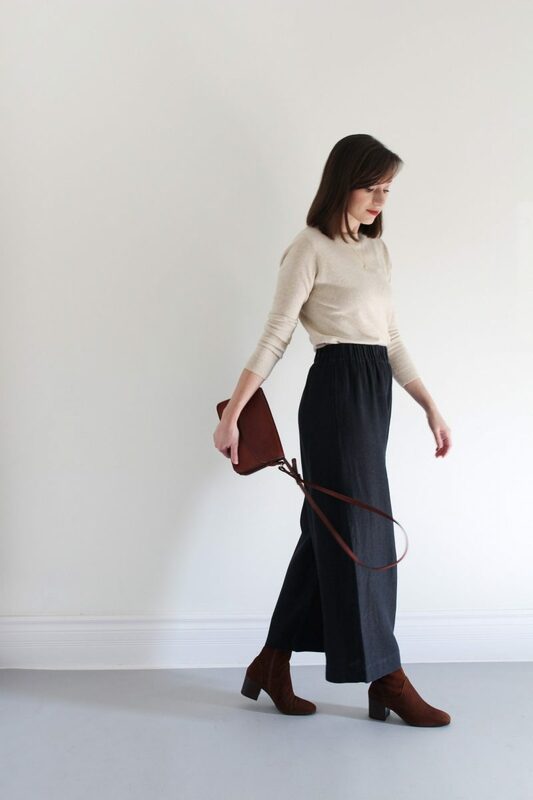 I also find a cropped inseam can actually give the illusion of a longer leg and pairs nicely with an ankle boot. While the weather permits I also like to show a touch of skin to break up all the material and the cropped pant and cropped sleeves allow for this. MY THOUGHTS ON THIS ONE: In addition to the repeating cropped sleeve and pant I repeated the whiskey leather in my boots and my watch and the black in my pant and bag. Another unintentional but happy accident was how the earthy tones in my tortoise earrings match the khaki coat. So much matching in one simple outfit! 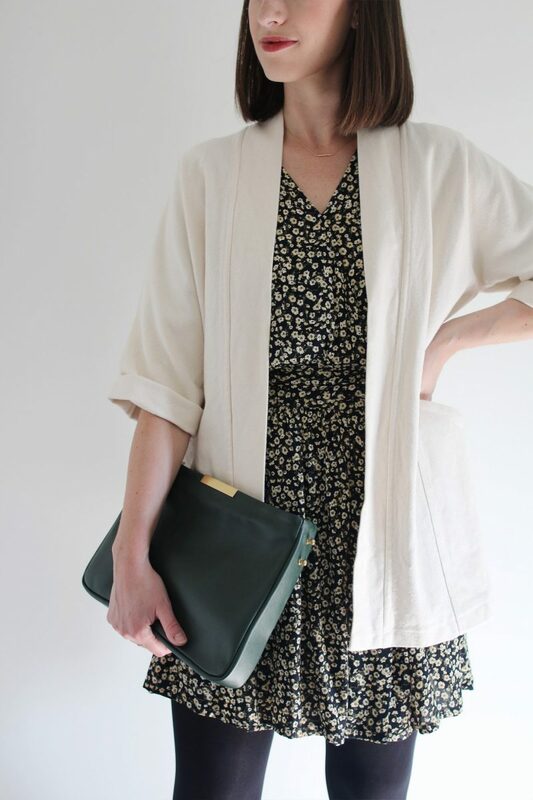 Because this tunic is quite roomy in the body and sleeves, I felt my canvas Harper Jacket would be best over top and it layered with ease. I also thought the pairing would work because the tunic is a blank slate while the Harper adds some clean lines, sharp angles and a bit of structure without being confining. Balance is definitely the key strategy in this look. Sidenote: I’m still so glad I bought this coat! Relaxed Tunic | gifted VETTA | $109 USD | Made sustainably in NYC. 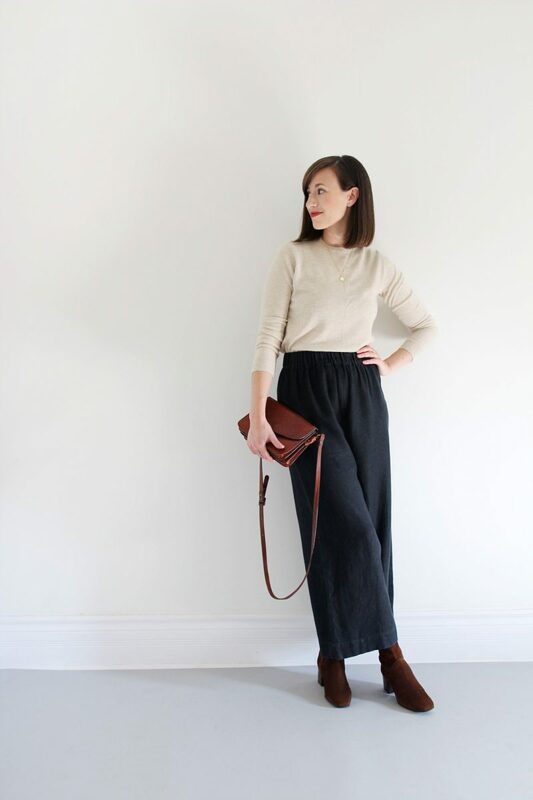 | I wear a size S.
Cecilia Pant | sold out Elizabeth Suzann | Linked to similar for $50 USD. 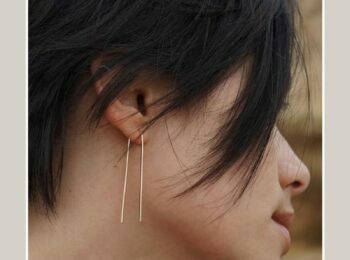 Kate Hoops | Machete | $44 USD | Sustainably produced acetate, Made in Atlanta. Pinky Signet Ring | borrowed ATTIC | $620 CAD $558 CAD with ‘STYLEBEE10’ until October 5th. | Cigar Ring | $950 CAD $855 CAD with ‘STYLEBEE10’ until October 5th. | Made to order in Toronto | See the full feature here. 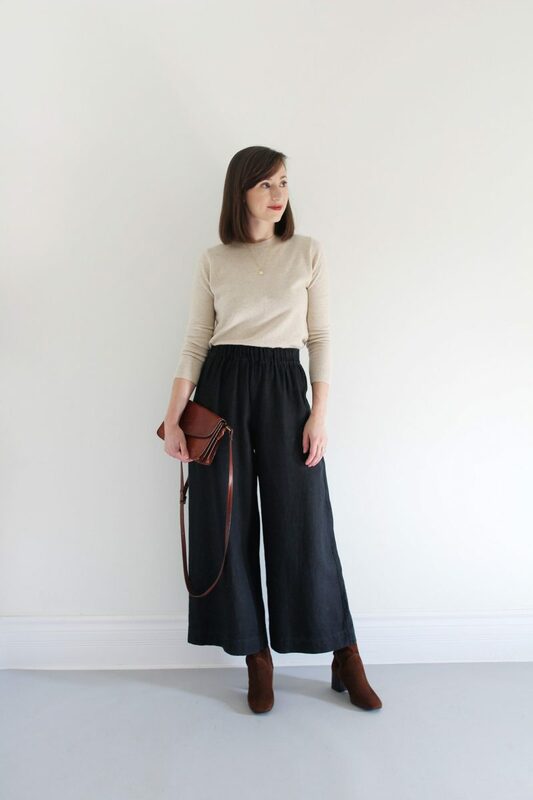 THE ITEM: Wide leg Florence pant in a midweight black linen. THE LAYERING TECHNIQUE: Similar to the look 3 I opted for a slim fitting sweater fully tucked into the wide waistband of the pant. Similar still, was the choice to wear contrasting tones, although I do think a black sweater with the addition of a brown belt would work really well for a monochrome vibe. Adding a simple gold pendant and an earthy lip colour gives it just the perfect dose of polish. 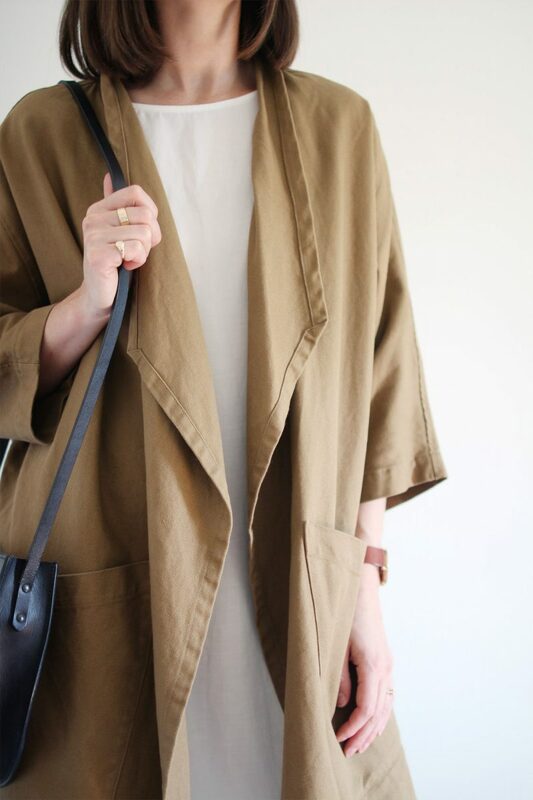 This one is also a great base for under duster vests, pea coats, boyfriend blazers, leather jackets and just about any pattern! MY THOUGHTS ON THIS ONE: I’m really feeling the autumn colour palette in this look. Oatmeal and washed black works so well with the rich oxblood leather and warm chocolate suede (which in this light look almost the same). Much like look 1, the simplicity is doing most of the work to give this look a sophisticated vibe while the proportions are keeping it interesting. 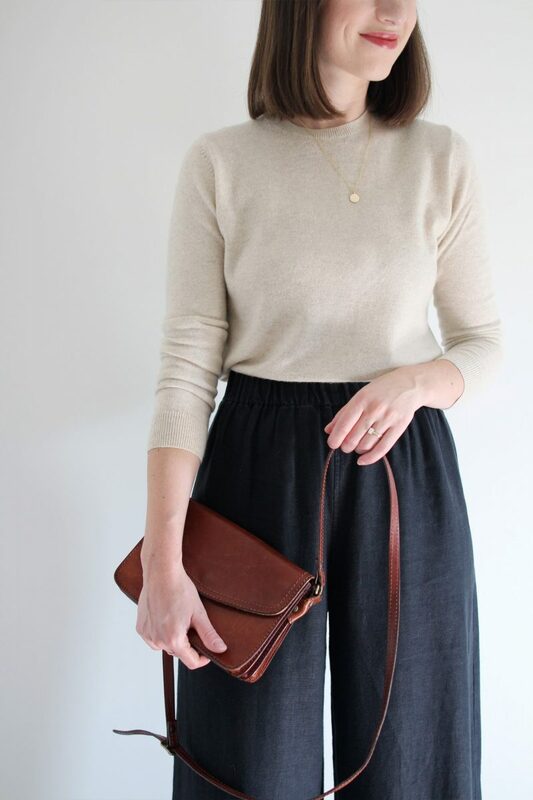 This one is getting filed under ‘foolproof fall looks’ and I’m excited to test this formula with my other florence pants and slim fitting sweaters. Vintage Bag | I love this one and this one! Dome Studs | $260 CAD $234 CAD with ‘STYLEBEE10’ | Moon Pendant | borrowed ATTIC | $595 CAD $535.50 CAD with ‘STYLEBEE10’ until October 5th. | Made to order in Toronto | See the full feature here. 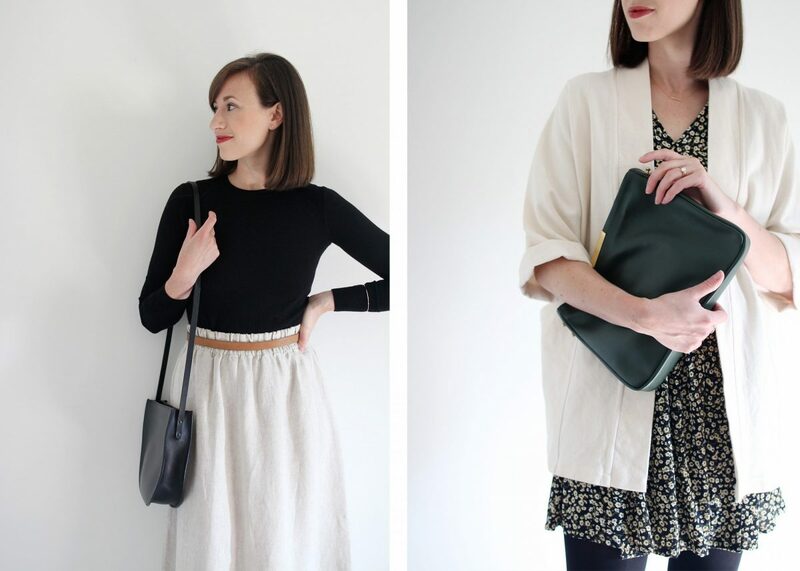 So there are some ideas to help you wear your summer favourites into the fall! Do you have any tips or tricks you’d care to share? Which of these 5 looks is your favourite? Have a great week and I’ll be back soon with some beauty favourites! This post is not sponsored or produced in partnership with the aforementioned brands but it does contain affiliate links. When you shop via the links above I may make a commission on a sale. Thanks for supporting Style Bee while you shop! All opinions are always my own. Hi – you have a wonderful sense of style! i love your shoe choices! i am looking to buy a new pair of boots. if you had to choose between the aquatalia boots or the everlane day boot, which would you go for? thanks so much! I love all the looks. They are all very stylish and stunning in their on way. Good thinking girl, and thanks for sharing. I just love love love the two last looks! What mastery of colors, shapes, everything! 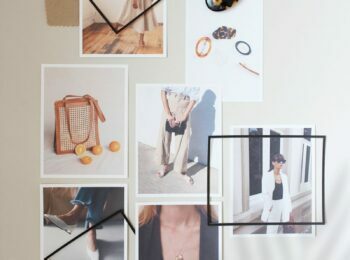 It is really inspiring to see these looks, it’s a great idea to try to transition summer pieces into fall, I had never thought about doing that for items that were typically summer related, such as linen, but I’ll definitely try to see how that could work in my closet! Thanks for the inspiration and well done about writing a post on this topic! Thanks so much for the kind words Bettina! It’s funny how we’ve sort of relegated certain materials to specific seasons but it’s fun to mix things up 🙂 Have a good week! Hey Linda, I’d wear opaque black tights since those are pretty much always a safe bet. 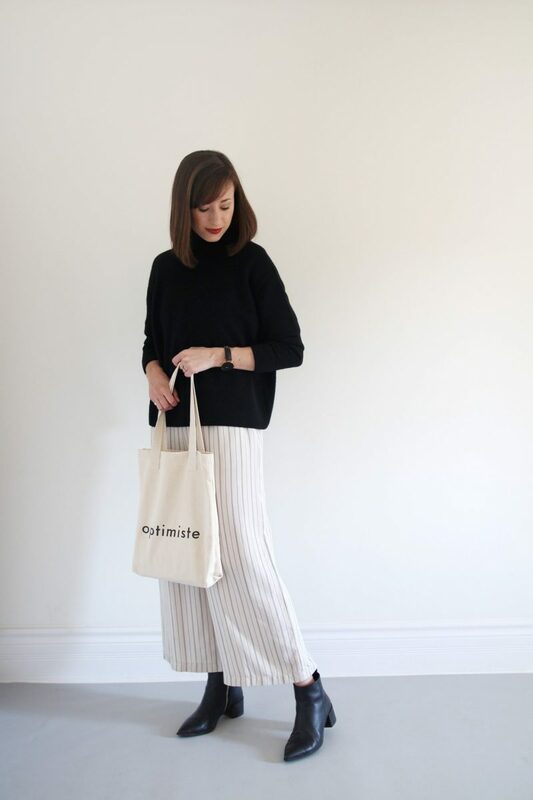 I will wear my wide leg pants as long as I can (with wool knee socks or tights) but in the deep of winter I usually stick to skinny jeans. You’re a styling genius my friend! Thanks for the inspiration. Summer is taking its last gasp this week in the Okanagan, with a high of +20 on Wednesday. So this post so so so so much helped me lay out a sweet plan for this week, woohoo! 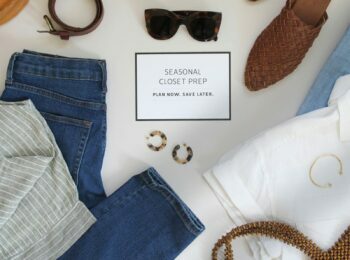 I swapped out my closet from summer to fall last weekend but dove back into my summer bin for a few items. Perhaps, I should have held off until the end of September. 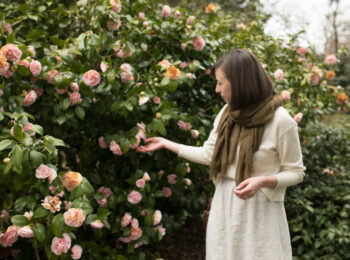 Your post is excellent and shows how to transition between the seasons with ease. Look 1 and Look 4 are my favorites. Look 1 gave me an idea of how I can wear my jumpsuit in the fall season, which is perfect for Vancouver. In the fall we experience rainy cold mornings, but in the afternoon the sun comes out and it’s quite warm. With this outfit, all I have to do is slip off the sweater. What I love about Look 4 is the subtle transition of colour to fall. The combination of oatmeal, black and chocolate are nicely done! As well, I love those boots! 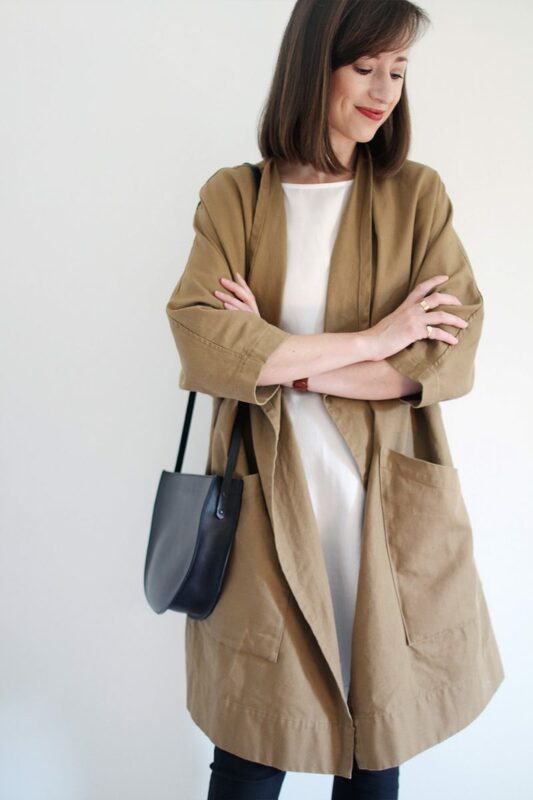 Absolutely love your style and ideas for a transitional wardrobe. Living in Florida, I can really see this working for me (it’s almost October and it’s still in the 90˚s). Thank you! So interesting. I have found that I like putting things away seasonally, to give me time to get excited about them again. But there are a few things I’m not ready to say goodbye to, including my new wide-leg jumpsuit. I had thought I would layer under it in the winter, but now I’m just as excited to try layering over it! Such a cool look. I agree. 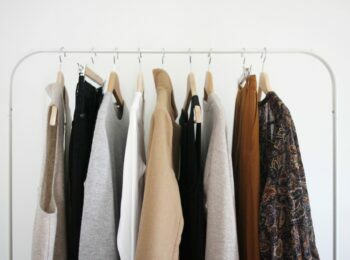 I am trying to develop a wardrobe that works all year. Of course, in Colorado there are weather exceptions. However, this post really helps in my quest. That’s great Elise! I know what you mean about the weather exceptions. February and March are usually pretty unforgiving here in Ontario. Enjoy autumn in Colorado! This is the perfect post for me, because my closet is big enough that I don’t have to put anything away when the seasons change. 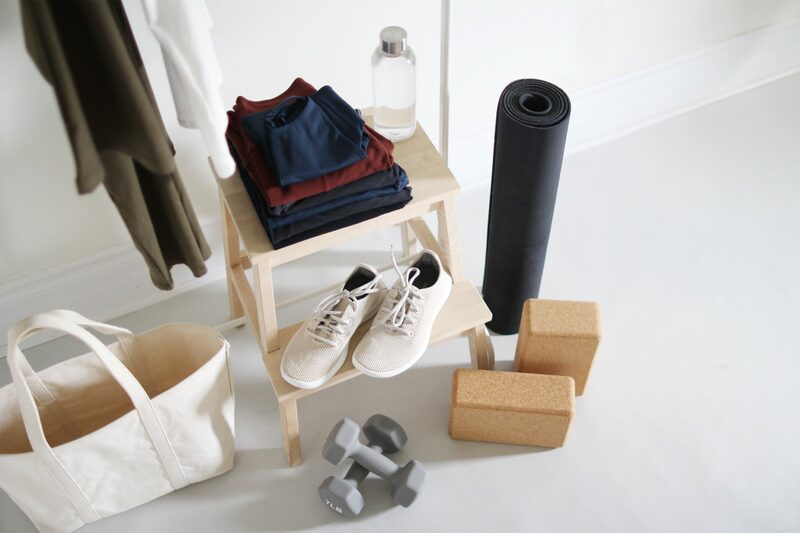 So I love posts about how to make full use of my closet. That’s great Carol! I’m so glad this type of post is helpful. Thanks for reading!